Classical Guitarist for Hire | Wellington and surrounding areas. Available for Weddings, Corporate Events, Private Functions. My name is Barry and I play solo Classical Guitar. I am an experienced musician who loves to play, and have done so for over 30 years. I studied at music at Otago University, graduating in 2004. If you are looking for some relaxing accompaniment or background music for your wedding, corporate event or private function then the classical guitar is an ideal choice. Intimate and unobtrusive. It is ideally suited to both acoustic or amplified environments and can add a real sense of style to an occasion. Situated in Karori, I’m available for weddings, private or corporate events and special occasions in Wellington, Upper, Lower Hutt’s and the wider Wellington area. The Guitar has been gradually developed over hundreds of years and there is a rich repertoire of material available as a result. Many pieces have been composed specifically for light entertainment, such as divertimento and interludes, right through to more contemporary and romantic pieces. Something to suit every mood or occasion. My repertoire includes examples from all the main historical periods of the guitar’s history. Including Renaissance, Baroque, Romantic and Classical as well as some more contemporary pieces and some of my own compositions. Please contact me for a quote as fees will vary depending on your particular requirements. Includes travel within the general Wellington, Lower and Upper Hutt areas and suitable amplification for a smaller to mid sized venue if required. For availability please use the form below and include any relevant details such as venue, size location and date of event. Wellington and surrounding areas. Available for Weddings, Corporate Events, Private Functions. 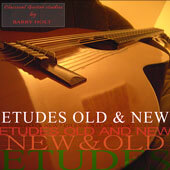 An album of guitar studies by Barry Holt.